Funded in part by the US Department of Homeland Security, it was developed to help security experts plan the safest and quickest way to get fans out following a terrorist attack. Using blueprints from actual stadiums, [researchers from the University of Southern Mississippi] are creating virtual, 3-D e-stadiums, packed with as many as 70,000 avatars—animated human agents programmed to respond to threats as unpredictably as, well, humans. Security planners will be able to see how 70,000 fans would behave—and misbehave—when spooked by a security threat. But a SportEvac avatar need not be a sports fan. 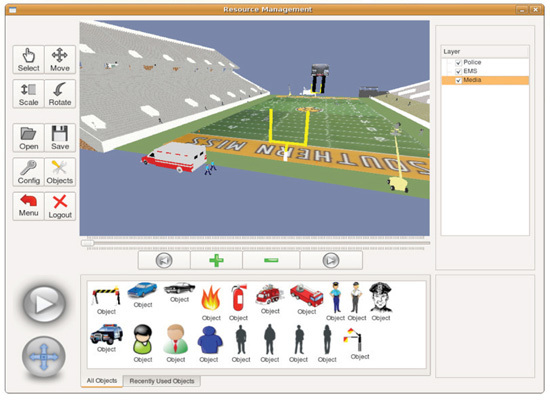 The simulation includes make-believe stadium workers, first responders, even objects, such as a fire truck or a fans car (screen shot). SportEvac tracks them all, accounting for scenarios both probable and improbable. Those scenarios include, among other things, panicked fans encountering a wet floor, a wheelchair-bound fan stuck in the crowd, a stubborn aisle-seater, a fan fetching a forgotten purse and an inebriated bleacher bum. Inevitably, we're led to wonder if SportEvac, or a later plug-in version of it for Rhino and even ArcGIS, can be used to design future stadiums and their environs, to actually embed evacuation strategies into the program itself. Can SportEvac be scaled up further to ManhattanEvac, in which you have over a million avatars and perhaps an equal number of scenarios to choreograph into an evacuation plan with minimal casualties? If he were alive today, would Busby Berkeley use a hacked version of SportEvac to pre-viz a musical extravangaza to soothe our weary souls during these troubled times?